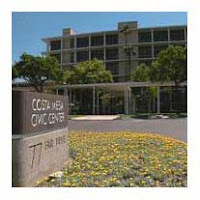 Today the Costa Mesa City Council will wrestle with the issue of the future of the Orange County Fairgrounds and Events Center. As I mentioned earlier, they will first discuss this subject in a closed session, apparently in the context of whether to - and how to - go about purchasing that 150 acre site to retain it as a Fairgrounds. We may, or may not, find out what went on behind closed doors when the regular meeting convenes at 6:00 p.m.
Near the end of the meeting we're supposed to get the report from the City Attorney regarding the possibility of placing the issue on the June, 2010 ballot to further insure that the Fairgrounds remains as such. Orange County Register reporter Ellyn Pak has a pretty good summary of events today, HERE. About the only thing she didn't mention is Jim Righeimer's effort to place the issue on the ballot. Quite honestly, because of the tight time constraints involved, it's going to be very difficult for Riggy to pull that off. The above-mentioned possibility of the council placing it on the ballot seems to have a better chance if it's not burdened with significant legal liability for the city because of the potential financial damage it could cause to the successful bidder. In between those two items the council will actually do the rest of the city's business. Among the important items to be discussed will be the revision of Aquatics Program fees; changes to Title 13 of the municipal code related to alcoholic beverage sales; another change to Title 13 regarding changes to the approval process for density of affordable housing projects and yet another change to Title 13 regarding temporary signs and banner use by Youth Program Group Users. And, don't forget about the group hug to be hosted by Assemblymen Jose Solorio and Van Tran in the Costa Mesa City Council Chambers next Monday, November 9th beginning at 9:00 a.m. Reservations for seats are required, although fewer than 20% of the seats have been reserved as of yesterday morning. You can call John Nam in Solorio's office at 714-939-8469 to confirm your attendance. So far the panel that will present views include, in addition to Solorio and Tran, Costa Mesa Councilwoman Katrina Foley; Costa Mesa Director of Development Services Kimberly Brandt; President of the Orange County Fair and Events Center Board Kristina Dodge; Fair CEO Steve Beazley; Jeff Teller, representing the Orange County Marketplace; Rick Hansen representing the Equestrian Center; Bob McKinnon, head of the Real Estate Division of the State General Services Department and Randall Cheek representing the SEIU. I'll let you know if I have further news and will post a reminder of the meeting later. That hearing will be televised live on Channel 24, CMTV, which will also appear on Channel 99 on AT&T's Uverse system. It will also be shown live on streaming video, available on the city web site. It will also be placed in the rotation for later viewing on CMTV. By the way, I don't expect to see Mayor Allan Mansoor at this meeting - his trial brought by the ACLU for Benito Acosta is supposed to begin that morning.